Hey Guys! As you know, I have been working on my goal of eating slightly healthier. 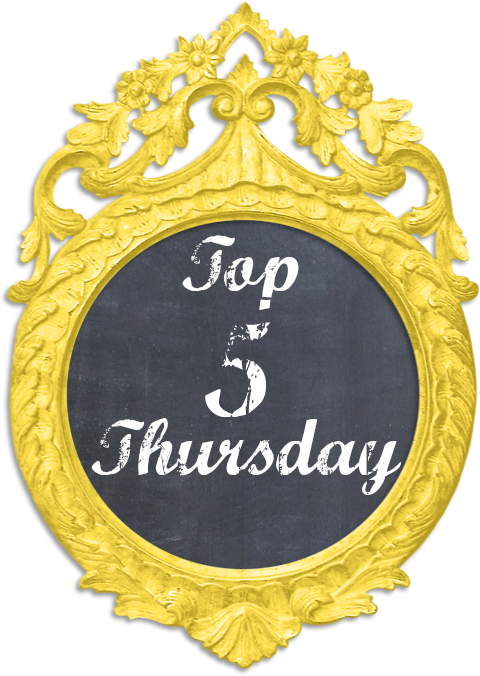 Last week when I was looking at some blogs on What I Ate Wednesday, I came across Kelly Runs for Food. 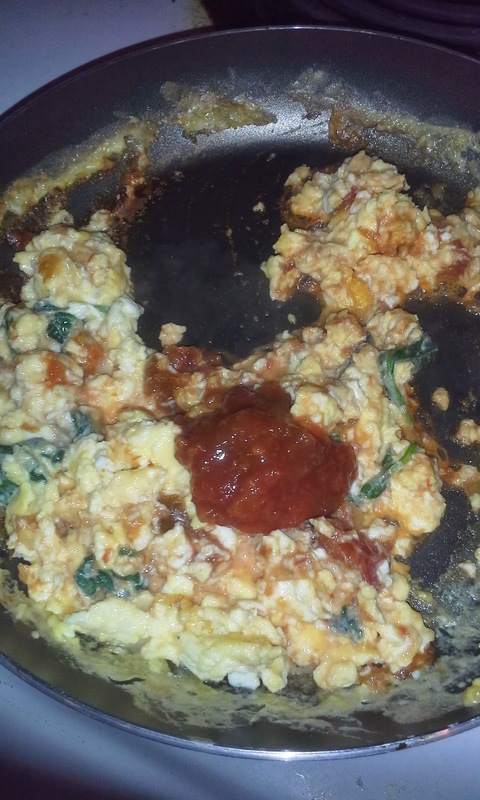 On it, she had scrambled eggs with spinach. I don't know why I had never thought of that! I have been trying to think of a way to get more veggies in my diet, but wasn't sure how, especially at breakfast time. This was a perfect idea! 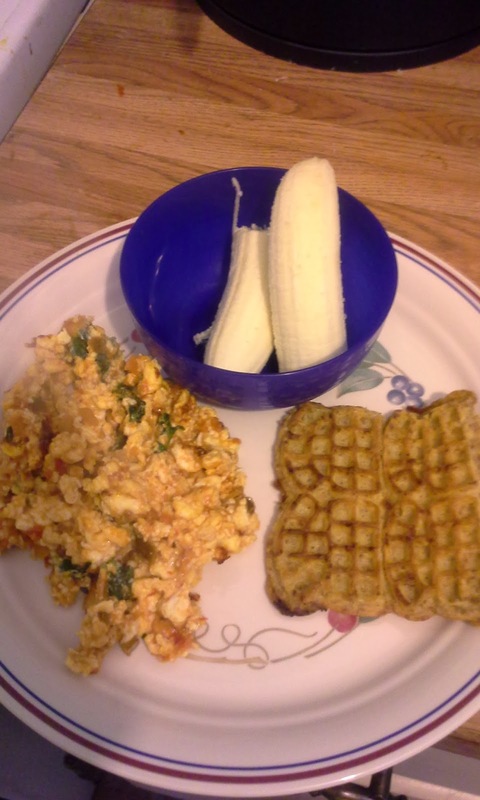 So today, I want to share with you my new favorite (and very simple) healthier breakfast. What you will need for this recipe is: Fresh spinach, two eggs, a slice of Velveeta (totally optional, but you know I can't resist cheese!) and some salsa. 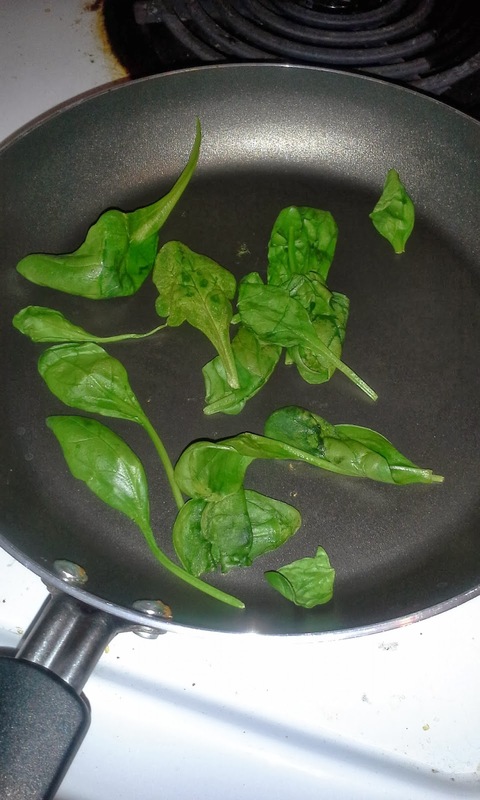 The first step is to take a handful of spinach and cook it down in your skillet. You can do this on a medium heat. It doesn't take very long for the spinach to wilt down, so make sure you keep an eye on it. 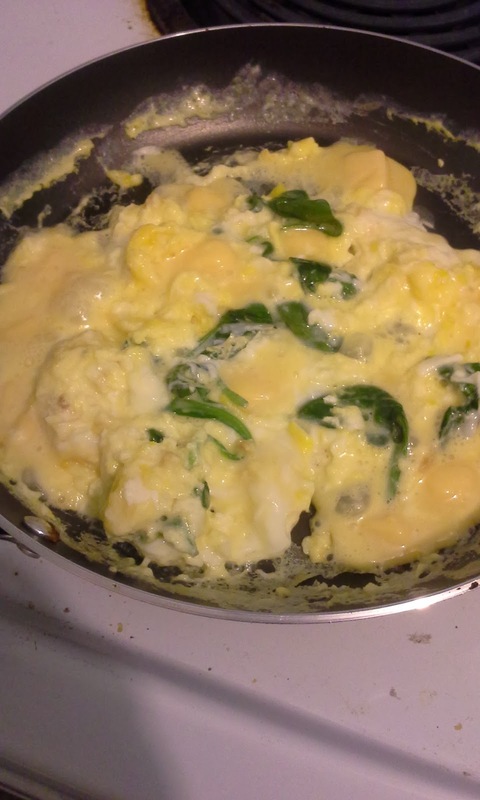 While the spinach is wilting, you can cube up your cheese and mix it in with your eggs. You can mix your eggs up however you like. I just scramble mine up with a touch of water. 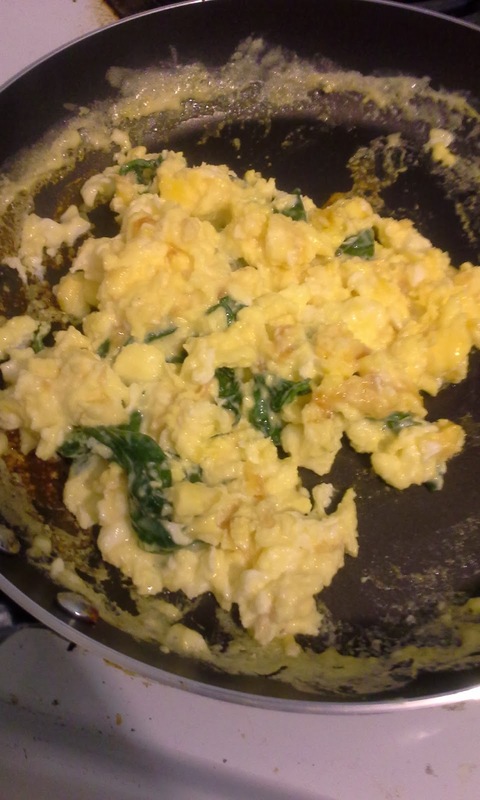 Once the spinach is wilted, just add your eggs to the skillet and cook like you would normal scrambled eggs. 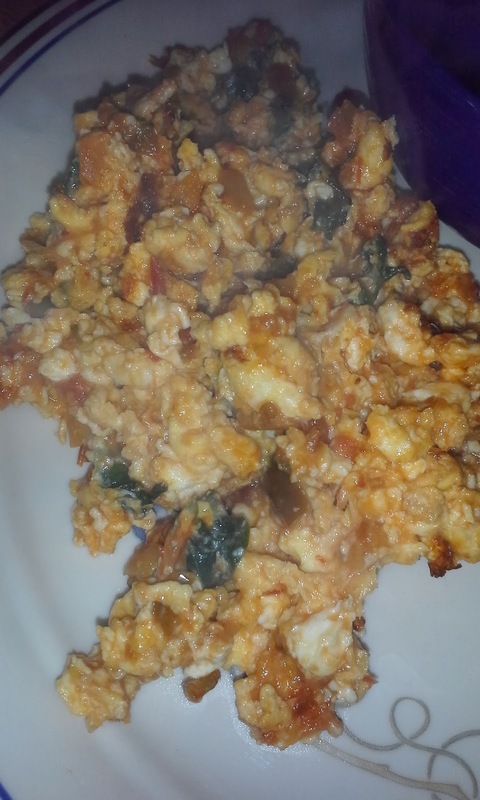 I like my eggs cooked all the way when I am doing scrambled eggs. After they are cooked to the consistency that you like, add 3-4 tablespoons of salsa. At this point I usually turn the heat up a little bit. This way, the cheese gets nice a golden brown on the bottom and it adds a ton of flavor. This is really good with just a slice of toast and some fruit. This day I had it with one cinnamon waffle and a banana. But whatever you like to eat this with, it is DELICIOUS! Please let me know if you try this recipe! What is your current favorite breakfast?